Co-drafted and coordinated by: Rachel Tansey, Pascoe Sabido, Jamie Henn et al. We are writing to you as a group of civil society organisations, groups and social movements deeply concerned with the fate of the climate. The devastating consequences of super typhoon Yolanda are the latest reminder of the cost of inaction, and the urgency of the task ahead. Yet the 19th Conference of the Parties (COP19) of the United Nations Framework Convention on Climate Change (UNFCCC), hosted this year by the Polish government in Warsaw, has taken unprecedented and damaging steps towards embracing the same corporations that profit from continued emissions while actively lobbying against effective and just climate action. The Warsaw COP has official corporate “partners” which include the fossil fuel industry and major polluters like PGE, Alstom, LOTOS, ArcelorMittal, BMW, General Motors and Emirates Airlines. Along with a large number of corporate-affiliated side events and the exclusive access to negotiators granted to corporate lobby groups during the business-only pre-COP in October, the hosting Polish government’s Ministry of Economy has teamed up with the World Coal Association – a coal industry lobby group – to put on a parallel “International Coal and Climate Summit”, falsely presenting coal as a central part of the solution to climate change and development. 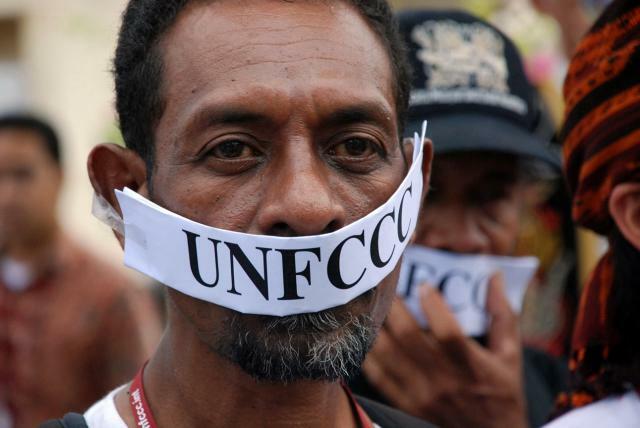 Added to this, the UNFCCC secretariat has created the appearance of sanctioning the coal lobby’s agenda by allowing executive secretary Christiana Figueres to address the coal summit, despite calls from both the youth constituency and from environmental and development groups not to attend. At risk are both our climate and the integrity of the UNFCCC as a multilateral process to tackle climate change. Therefore there is an urgent need for rules to govern the relationship between the UNFCCC and the fossil fuel industry, including obligations for COP Presidents. Rules that would ensure the current damaging situation is avoided, by ending the undue access and influence of polluting businesses and industries, recognising that their direct commercial interests are fundamentally and irreconcilably in conflict with the urgent need for an equitable and ambitious climate policy. The UN Global Compact’s recently released “Guide for Responsible Corporate Engagement in Climate Policy” (produced in cooperation with the UNFCCC and others), recognises the damaging effect of the fossil fuel industry on climate policy, but its recommended voluntary guidelines for corporate lobbying around climate are woefully inadequate in light of the planetary emergency. To protect the climate and the UNFCCC, an approach corresponding to the scale of the climate crisis is needed. Other UN bodies have faced similar challenges in addressing the undue influence of harmful industries and dealt with the situation effectively, such as the UN World Health Organisation (WHO). Article 5.3 of its global tobacco treaty, the Framework Convention on Tobacco Control (FCTC), enshrines in international law the principle that the tobacco industry has no role in public health policy-making, due to the “fundamental and irreconcilable conflict between the tobacco industry’s interests and public health policy interests” and states that “Parties shall act to protect these policies from commercial and other vested interests of the tobacco industry”. We urge you to look at such examples and take commensurate action to protect climate policy-making from the vested interests of the fossil fuel industry – or companies whose core business model depends on the excessive emission of greenhouse gases – and their attempts to undermine and subvert urgently needed action.